A workshop was organized today by Curative Service Division, Ministry of Health and Population to finalize draft Mental Health Policy and Legislation. The division is now taking this forward for necessary approval process soon. Please, find attached the drafts of policy and legislation for the reference. If any one want to give feedback on these documents, I would be glad to pass it on to focal person who is coordinating with the ministry. Kindly write to me in direct message. The deadline for communication is 14 June. 15 December is the deadline for the submission of abstracts. Just a week left! We would like to encourage all to present any research/work done in the field of mental health and psychosocial support (MHPSS) in the form of Paper or Poster presentations. Open Papers (OP) — Presentation of data reflecting an individual study or idea that is not part of a symposium. The organizing committee will place the OP into related themes. Each theme will last for 60-90 minutes, but individual papers should aim to be no more than 8-10 minutes with a five minute question time at the end. Poster Presentation (PP) — graphic representations of the results of empirical/conceptual/ organization work put on display by individual/group of delegates and open for questioning or discussion by those interested. Abstracts in standard format should be e-mailed to abstracts@mentalhealthconferencenepal.com, imhcn2017@gmail.com Last date for submission is August 15, 2017. All selected abstracts will be published in the Conference Souvenir. 1. 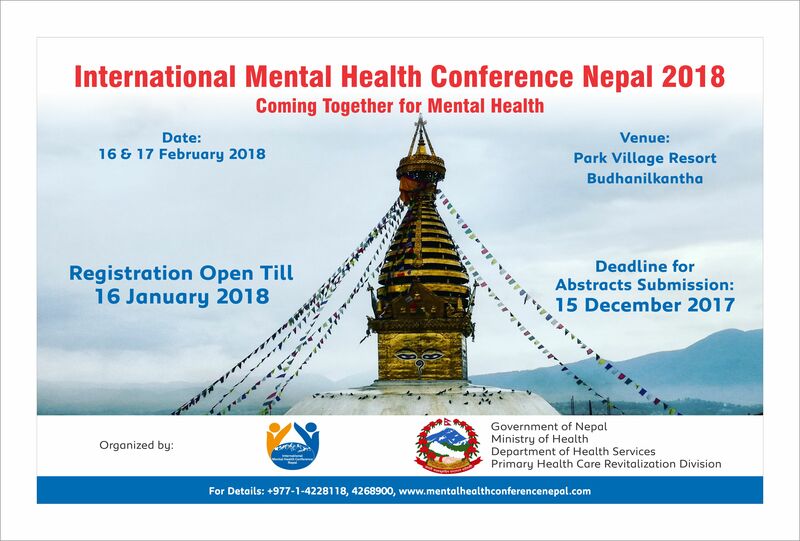 Abstracts must be submitted via e-mail to abstracts@mentalhealthconferencenepal.com, imhcn2017@gmail.com by August 15, 2017. 2. Abstracts must be written in ENGLISH only, and should not exceed 250 words (Not including title, authors, key-words and affiliations). 3. Abstracts must be in text format, DO NOT include any graphs, tables or images. 4. You must indicate whether you wish to have your abstract considered for OPEN PAPERS (OP) or POSTER PRESENTATION (PP). 5. Please provide the presenter’s brief biography in no more than 200 words. 6. Abstracts of scientific research must be submitted using the designated field: Introduction, Methods, Results, Discussion and Conclusion. We only accept abstracts related to the conference theme. 7. Abstract should be typed in Times New Roman font, size 12 with 1.5 line spacing. 8. Accepted abstracts are eligible for presentation after receiving full registration fee from the author/ presenter. If registration fee of the presenter is not received by due date, his/her paper is assumed to have been withdrawn. Once the abstract is submitted, changes, correction or rewording are not allowed. The submission should be carefully proof-read and corrected by the author. Individual authors are responsible for the accuracy of the information supplied, as accepted abstracts will be printed on the Conference Souvenir. 9. All Abstracts will be reviewed by the Scientific Committee. Only those abstracts judged to be of high quality and of relevance will be accepted. Acceptance notification will be sent to the first submitting author and presenter with further instructions. Final presentation style will be subject to the decision of the Scientific Committee. 10. Failure to comply with these requirements will exclude the abstract from consideration. The organizing committee compromises of academic institution and different I/NGOs such as Dept. of Psychiatry- TUTH, UMN, CMC, TPO, Koshish, Americares and ACF. Photo feature of Annual 9th Leadership in Mental health course organized by Sangath and London School of Hygiene and Tropical Medicine in Goa, India. The participants, tutors and staff of LiMH course 2016 at Panjim, Goa. Presenting the group work on Nepal Mental Health Plan at the end of the course. Our plan won the popular votes by participants and faculty. Participants from Nepal: Madhur Basnet from BPKIHS, Ganesh Maya Shrestha from Leprosy Mission and myself from ACF. Thanks to my former employer, ICRC for partially sponsoring my participation in the course. I recently participated in 5th International Workshop on Psychological Intervention after Disasters (PIAD) which took place from 14-17 November in Manila, Philippines. This workshop is organized annually by International Council for Science (ICSU) Regional Office for Asia and the Pacific (ICSU ROAP) on behalf of the International Union of Psychological Science (IUPsyS).This workshop is fifth in a series of similar workshops dealing with psychological research and practice in disaster context and how affected communities deal with the aftermath of such disasters from the psychosocial perspectives. The workshop invites applications from practitioners from Asia and Pacific region for two important facts that over 60% of the world’s population are affected due to 41% of the natural disasters around the world occur in this region and secondly, the majority of countries in this region often lack an advanced infrastructure or support systems to support the affected population, more so with the mental health and psychosocial needs in the post-disaster context. The participants from various countries get a chance to learn from experienced faculty, interact and exchange experiences with other participants and present their own study in a form of poster during the period of four days’ workshop. Presenting my poster! Just below. I would like to share the workshop resources which can be accessed here: http://www.icsu.org/asia-pacific/news-centre/news/5th-international-workshop-on-psychological-intervention-after-disasters It includes ppt resources presented by the faculty. I would like to thank Prof. Nordin Hasan and Mr. Mohd Hizammdin Jaafar from ICSU for their support. And it was a big pleasure to meet and learn from Joop de Jong who was in the faculty this year and who is also the founder of TPO. Thanks Joop, esp. for the breakfast conversations.